Weld Trailing Shields are an important addition during the welding of stainless steel and titanium tubes, pipes and sheet metalwork, to ensure that the weld environment is totally free from oxygen. Weld Trailing Shields provide an additional inert gas coverage to that of the welding torch, during and after welding, which forms a protective layer over the weld, preventing it from coming into contact with oxygen and oxidising. Stainless steels and titanium are reactive metals and therefore hot weld metal will attract any oxygen that is present during welding which will lead to a loss of the metals’ resistance to corrosion. What is a Weld Trailing Shield? A Weld Trailing Shield is a small piece of lightweight tooling that attaches to any welding torch including TIG/GTAW, PAW/Plasma and MIG/GMAW. The Trailing Shield is connected to an argon gas supply, diffusing gas evenly through the stainless steel mesh built into the body of the shield. 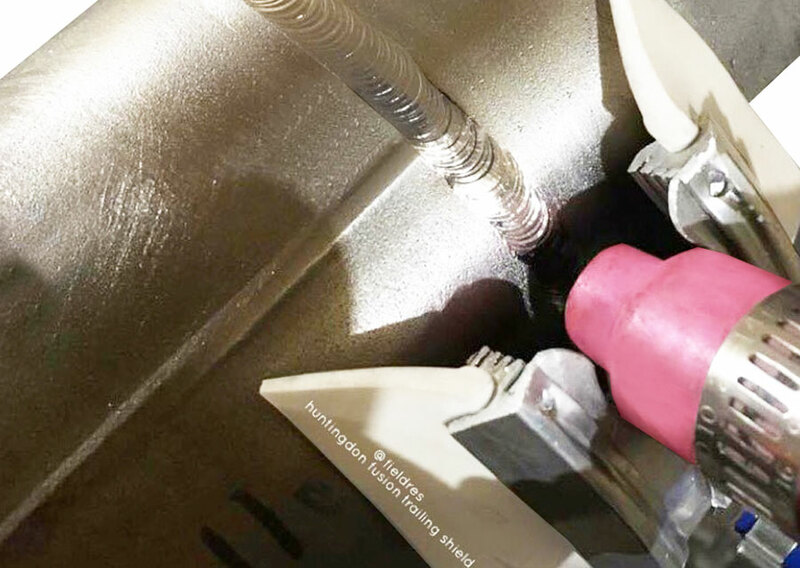 At each side, silicone rubber side shields provide a barrier to prevent the gas escaping sideways thus remaining over the weld metal. 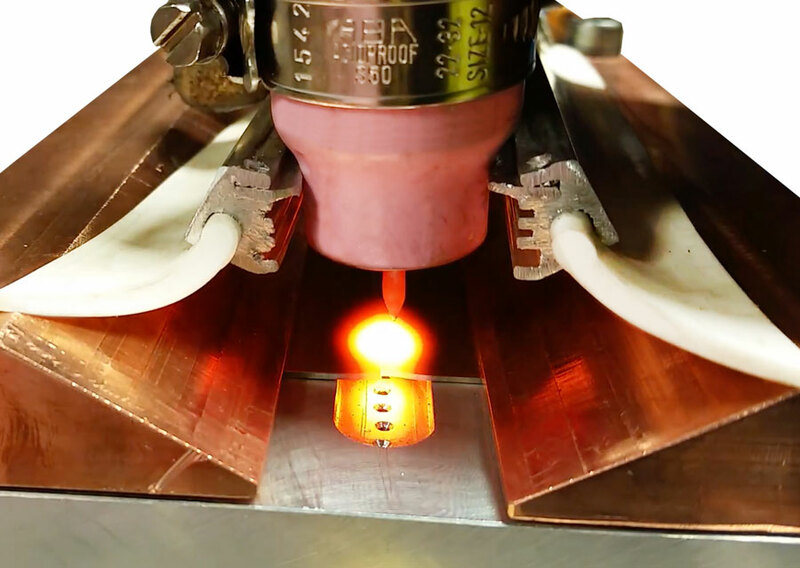 As the welding torch is moved forward, the weld remains under an inert gas shield until the welded metal has cooled below its oxidation temperature. Weld Trailing Shields are manufactured for tubes, pipes and flat sheets of metal. These shields are in use Worldwide for titanium, zirconium, duplex and stainless steel welding. Do the Trailing Shields fit any welding torch? Yes, they are designed with a universal worm drive circular clip that will open and close around any shield gas nozzle on any TIG (GTAW), MIG (GMAW) or Plasma (PAW) manual or machine torch. 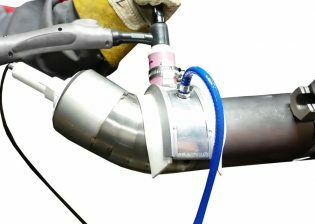 Can I weld on the outside of pipes and vessels with Argweld® Weld Trailing Shields®? Yes, Argweld® Weld Trailing Shields® are kept in stock for all sizes of pipes and vessels above 0.5” (12mm) diameter. Simply tell us the diameter of your pipe or vessel and we will provide an exact match. Can I weld on the inside of pipes and vessels with Argweld® Weld Trailing Shields®? Yes, for those people making welds on the insides of pipes and vessels we manufacture the Argweld® Weld Trailing Shields® with an internal radius to suit the exact diameter of the weld being made. What is the temperature endurance of the Shields? The side shield gaskets are made of silicon rubber, which is temperature resistant up to 200ºC (392ºF). These are low cost, consumable items and once burnt, can be replaced. Each trailing shield will pay for itself in just one weld. I am doing laser welding on small round parts that are 10 mm in diameter. Do you have trail-shielding for small dia round parts? The smallest Shield available is 1″.